One of my favorite podcast episodes, and one I go back to fairly often, is Strong Towns Talking Transit. It was an off-site panel discussion during Railvolution. A major theme from that discussion was that a good transit project connects productive places. I’ve been thinking about that insight a great deal this past week. I had the honor of joining a group of leaders from Grand Forks, ND on a visit to Fort Collins, CO last week. Like Grand Forks, Fort Collins is a smaller city (pop. 155,000), and a college town on the grow. There was a lot to learn. I was most excited to see Fort Collins’ new Mason Street Corridor. This development corridor in the heart of the city features MAX, their new bus rapid transit system. MAX has been a big success. Ridership has exceeded expectations with a seasonally adjusted average of 5,300 riders per day (projections were for 4,000). They have had to add buses to the route to keep up with demand and even run a small bus during peak times to pick up overflow. Part of what makes it such a success is that it is connecting productive places. What does that mean? For one, it means connecting places that have enough density to support transit service. Old Town and Colorado State fit the bill there. It is true the route continues south to lower density auto-oriented areas such as Midtown, the Foothills Mall and South Harmony. However, the core of the service is campus and downtown. The Midtown area is already seeing some denser, mixed-use transit-oriented development and the South Harmony section includes the South Transit Center which has attracted a healthy number of park and ride commuters. There were only three parking spots remaining when I went through the lot on a Tuesday shortly after 9am. It was clear from riding MAX that this isn’t some ‘build it and they will come’ transit line out to a corn field. South Transit Center parking lot fills up with park and ride commuters. Another part of connecting productive places is connecting people to jobs and services. Again MAX hits some high notes. Downtown is an employment hub as well as a hub for government and social services. Not to mention retail and entertainment. CSU is an employment hub and, of course, provides higher education - an important service. On top of all this, both campus and downtown are fairly dense residential areas. By connecting productive places and people to jobs and services, MAX is attracting transit by choice riders including families with children and senior citizens. MAX bus with shuttle to the Denver airport in the foreground. Local and regional transportation. Bus Rapid Transit (BRT) and the amenities it includes compels people who have never ridden a bus to give it a try. Performance is another key factor. 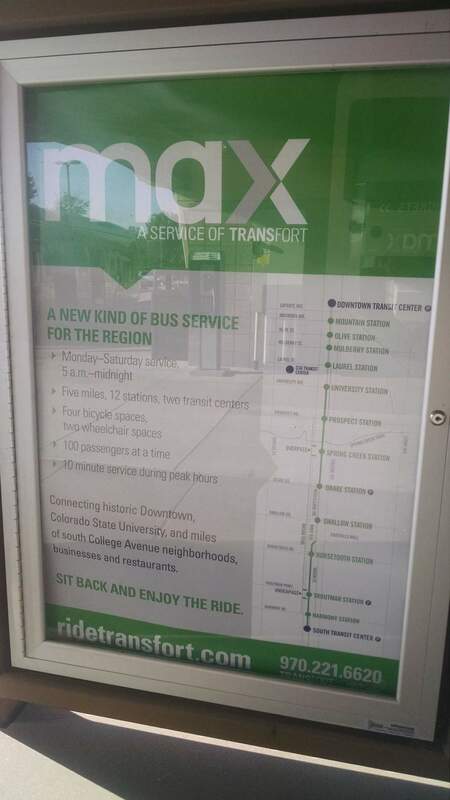 MAX provides 10 minute service during peak hours. MAX uses a dedicated guideway, unimpeded by traffic for 75 percent of its route leading to a more reliable service. Another component of a successful transit project is the ability to spur redevelopment and do some value capture. Fort Collins has seen a surge of apartments and mixed-use buildings along the Mason Corridor. And there’s potential for plenty more development. Max Flats with transit station in front and an excellent local coffee shop at street level. The Mason Corridor makes it easier for Fort Collins to focus development in areas with existing infrastructure. Developing along the Mason Corridor also gives residents more mobility options. In addition to the transit piece, there is a bike and pedestrian path that runs along the entire length of the Corridor. I enjoyed exploring the Mason Corridor and riding the MAX. It has set the table for a more efficient and people-focused development pattern in Fort Collins. I look forward to seeing how the Corridor continues to develop. We often associate rapid transit with larger cities. MAX demonstrates that smaller cities can consider this option as well.